If I met a kid who dropped out of high school and did not know what to do with his life, the first thing I would do is recommend South Carolina Youth Challenge Academy. This program is one of the most life changing things I have ever been in. The first time I saw my mother after being enrolled in South Carolina Youth Challenge, she said she did not see a trouble making teen instead she saw a young man. I don’t think I have ever been that proud in my life, when my mom told me that. I’m also glad I made it this far because if I would not have made it this far. I would be six feet deep. I grew up in a single parent home. What threw my life off track was that I was the kid that loved trouble. I was what the court system called a statistic. One of the big problems I had was that I had to be the center of attention and that got me the wrong attention. I ended up get arrested 9 times in a 2 year span. I definitely got the attention but the wrong attention and from the wrong people. So I started to change my life but I only changed for about 10 months before I got in trouble again. This time, other people were involved with me getting in trouble. I was in a stolen car with a friend and he ended up wrecking into another car head-on. We almost took the lives of 2 other people. But the trouble did not stop there, I ended up getting in trouble two more times. I decide the criminal life was not for me because I kept getting caught. I found out about Youth Challenge through my probation officer. I looked Youth Challenge Academy up so I could learn a little bit more about it because at first, I did not like the idea of being at a place for 5 months with complete strangers. What got me really interested in Youth Challenge Academy is how much my mother was looking in to it. So I started to think if my mom wants me to go maybe this is the best for me, so I signed up and I came here. South Carolina Youth Challenge has done an amazing amount of things for me. The number one thing is organization. When I was at home my room was a mess. You could not find a bright neon sign flashing in the mess. So when I got here I thought I could do what I wanted. The sergeants helped me change that. I also had a problem with lying to try and get out of trouble. Sometimes it worked! When I got here I tried to do it but the sergeants caught on to it. I learned quickly that I have to break that habit. I also learned that the sergeants are here as a life coach. They are here to break you down and build you up into a better person. It’s all about tough love here with the sergeants. They also give you life lessons that will help you get out of the court system, help you go further in life, and help you achieve your goals. I also learned another important life trait called responsibility. I never knew how important responsibility was until I started to learn the trait. Discipline is also another major life skill that Youth Challenge Academy has taught me. Without discipline you basically have no self-control or manners. If you go to a job interview and you walk in with your pants sagging and looking some type of way, do you think they will hire you? No, because you have no discipline or self-respect. Also, South Carolina Youth Challenge Academy helps you in every single way possible to obtain your GED. They have GED books in the dorm, they have teachers to help you, and they give tutoring if you still don’t understand it. The only way you won’t obtain your GED is if you don’t try. They offer so many certifications like driver’s education (if you have your permit), 3D printing, and forklift. They also have sports teams to help you have even more fun while you are here. They also give you so many things to help you get your dream job. South Carolina Youth Challenge also has a new program called Post Challenge where they send you to college for free! If you don’t like free college then there is something wrong. But to do any of these things you have to have good behavior. Everything you do here is based on your behavior and attitude. Cadet Polanco, K; Cycle 35 $500 3D PrintingThinkLink Scholarship Recipient. If I ever saw someone going through what I went through I would honestly probably cry. I never ever want anybody to struggle and to seem like they hit dead end. 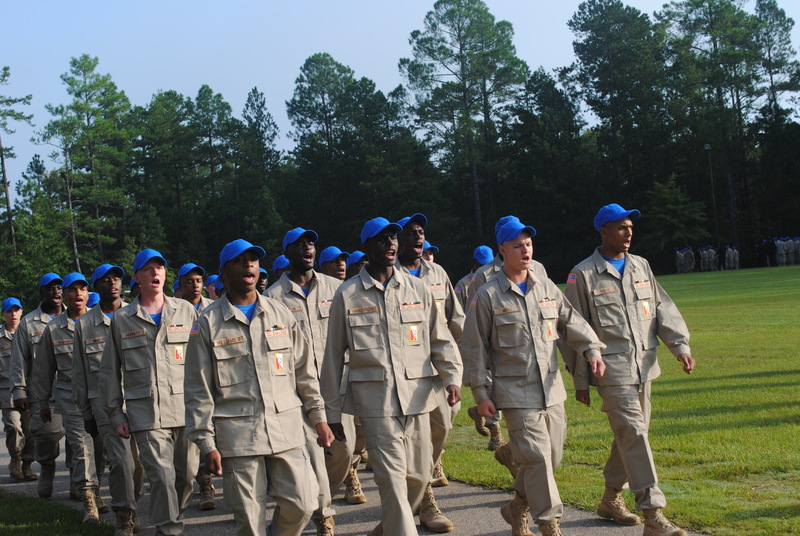 South Carolina Youth Challenge Academy gave me stability, and discipline. It made me feel like people actually cared about how I end up in life. Before South Carolina Youth Challenge Academy I was a mess, like I literally was a mess. You couldn’t tell me anything! It was my life, I do what I want when I want. The worst part about it was I repeatedly broke my mother’s heart. You can’t even count on your fingers how many times I told her I was going to change and I didn’t. I even got on my knees and said I was but like every other teenager I was in love. I was young and dumb, young, dumb and in love. I thought he was the love of my life and that were going to be together forever. Of course, I never thought that he would put me in a situation that could have ended my life. April 24, 2015 worst day of my life. I remember so little but I get these terrible flashbacks that make me feel like only yesterday I got shot. It was about 5 o’clock the day before April 23 I was doing my thing hanging out smoking taking my usual 2-3 xanax when my boyfriend called me, there was going to be a smoke/chilling thing in red roof Hardeeville of course I went. That’s all I remember from that day. Back to April 24th the morning off I remember calling my mom after getting shot she thought I was lying I don’t blame her though. I was like the boy who cried wolf to her. I remember being on the helicopter to savannah memorial and that’s it. Shortly after that I was scared to be around guns and I was scared to smoke I was just scared, so scared I slept with my parents for a few weeks like I said I never want to see anyone in a place so low like I was. I can proudly say I’m clean and I’m the happiest I’ve ever been being in this program. Not once I said I wanted to go home and when I was home I was ready to come back. This is my home. These cadres mean something to me all of these 18 other girls mean something to me I love them and I want them all to succeed. I recommend South Carolina Youth Challenge Academy because I honestly finally feel at peace with life and my mom is the proudest she’s ever been with me and that’s all I can ever ask for. So I highly suggest that you take some time away from all the smoking and drinking to realize you are someone in this world. You think 5 months is a lot, it’s really not. I’m already at week 22, time flys by so quickly and I feel so amazing being here. They feed us 3 times a day plus a snack, school Monday through Thursday 8-3 to help us further our education, field trips on Fridays, mentor pass on weekends, sports, like doesn’t that sound so good?? Most importantly we march and we have a family day wouldn’t you love to see your parents cry? Tears of joy of course knowing that you’re finally doing something good in your life. For me the journey doesn’t stop there. Imagine furthering your education. After receiving my G.E.D I plan to go to Aiken Technical College and continue my education and after Aiken I plan to have a happily ever after. Hopefully you open your eyes before something happens that can possibly end your life. I wish nothing but the best for you. – Cadet Polanco, K; Cycle 35. My son struggled academically throughout school. It seemed to get worse after he failed a grade. I made a decision to pull him out of public school. I home schooled Ra’Shawn with the hope of getting him back in his correct grade. After two years of home schooling, our family decided it would be best for him to go back to public school. He started out great with his grades, but then he went downhill. He was never disrespectful to me, his father or any other adult for that matter. It seemed his problem was not being able to focus in class; he was silly at times and found life to be fun and games. I admit I was getting to my end, because I wanted nothing but success for my child. With all my efforts nothing was working. Ra’Shawn just seemed to give up because he was so far behind in school. My family has a great support system and we just could not figure out what went wrong. I thought about other program, but didn’t like the reviews I was reading. I reached out to his school counselor in desperation, to see what we could do together to try to help him get where he needed to be. After not getting the support or answers I was looking for, the counselor then began to give me a list of alternative programs. The South Carolina Youth Challenge Academy (SCYCA) stood out to me. I researched SCYCA over and over, read reviews and decided this maybe the place for my son. I have to admit I was a little skeptical at first. After attending a SCYCA orientation, and meeting some of the staff, I felt this was it! Nothing was sugar coated, I felt my son needed this program. My family dropped Ra’Shawn off January 6, 2014 for intake, our next time seeing him was February 28, 2014 family day pass. I saw a difference in my son already! He has matured so much in such little time. He even washed the dishes after breakfast without anyone telling him to do so. That meant a lot to me, because, this is something he would have never done. I am a proud mom right now! I know this is just the beginning for him. Thanks to all the staff at SCYCA keep up the great work. By the time I turned eighteen I realized, I had to do something different with my life. So I decided to take the Challenge and attend South Carolina Youth ChalleNGe Academy. The academy has help me change my life by teaching me about self-discipline, integrity and life coping skills. I now have plans and goals for my life and know what I need to do to achieve them. At South Carolina Youth Challenge Academy I enjoy doing military training I never thought I could do before. I never thought about the military before or the opportunities that I could gain by joining. This program is giving me the education I need to grow. I also participate in sports which, I love and working out every day. No where I could go, no where I could be. Wandering around this world of sin. Searching for help and a place to be. Youth ChalleNGe had a place for me. South Carolina Youth ChalleNGe Academy was a choice I made to help me become a better young adult. During the first two weeks it was hard going through the residential phase but it only showed me how the program works. I came to Youth ChalleNGe from Baltimore, Maryland to show my family members I need to change from the street life. Every morning I feel I want to go back home but I realized that I need to make this change to make my mother proud. It may not feel good always having someone on your back but it helps to show what you need to improve on. I’m now in YCA and I’m on of the students that gets a chance at taking a Midland Tech class to earn early credit hours. The opportunity to come here made me change and look back at the silly choices I have made. If you look at obtaining the GED as a goal I’m sure the program will go by faster. In the future if you want to experience a change like me then come to the South Carolina Youth ChalleNGe Academy. My name is Jazmin Blandin. I am a CY 30 cadet at South Carolina Youth ChalleNGe Academy (SCYCA). SCYCA is a life changing experience. I have met new individuals in my platoon and they are becoming family. You have to learn how to deal with your problems and focus on yourself. SCYCA has taught me skills in the area of education, teamwork, life coping skills, leadership, followership, physical fitness, and service to the community and citizenship. This program is meant for youth that really want a change in their lives. If I could give advice to anyone enrolling in the program I would tell them that, “if you come to SCYCA with a bad attitude you need to change it. The staff members cannot help you change, if you won’t put the effort into changing yourself”. I believe that no one can help you until you want to help yourself. SCYCA can keep you from taking the wrong path in life. Coming to SCYCA was the best decision I have ever made. This program is a great way to graduate with self confidence and earn your GED or high school diploma. South Carolina Youth ChalleNGe Academy allows the cadets to take field trips and participate in various activities throughout the cycle. I also like that I have the opportunity to get a class ring. I know my family is going to be proud of me. I’m going to be proud of myself when I walk across the stage at graduation. SCYCA is the place to be, the program might start off tough but in the long run you will realize that SCYCA is a wakeup call for what life is really like. If you are the type of person that does not take anything seriously, SCYCA will teach you about life. This program will help you make positive changes in your life. South Carolina Youth ChalleNGe teaches that you can do anything, if you set your mind to it. Thanksgiving Activities: What Are You Thankful For? I am very thankful for my youth challenge family that has been here for me through my time of struggle. I am proud to say that cycle 29 was the first cycle to eat thanksgiving lunch in the main DFAC with Colonel Jackie Fogle, Mr. Milton Montgomery, CSM Michael Parker and the rest of the South Carolina Youth Challenge Staff. The lunch was amazing. The atmosphere was wonderful! We all sat and ate and thought about all the things we were thankful for. Thank you South Carolina Youth ChalleNGe Academy. It was a different experience than what we are normally use to, sitting in the DFAC and eating lunch with all the staff members of SCYCA. I want to thank the main DFAC for allowing the Academy to come eat lunch. We had very good food!!! There was turkey, ham, green beans, chocolate cake and lots more. We had the opportunity to talk while eating our meal. The best part was eating lunch was Colonel Shealy, Colonel Folge and Mr. Montgomery. They took time out their schedules to come eat with us. Who knew our science teacher Ms. Mullins could make learning so sweet by allowing our class to use candy to learn about plant cells. I never knew what cells looked or worked like. I never thought of cytoplasm as being wiggle like jello and a nucleus being soft like a marshmallows. Ms. Mullins introduced the academy to a fun experiment that was educational as well. Not only did I receive a better understanding of the parts of the cell, I now know how they function. I speak for the academy when I say who knew learning could be so much fun. South Carolina Youth ChalleNGe Academy offers a placement program, which helps graduates secure employment, continue with furthering their education, or enlisting in the military. On a placement field trip SCYCA visited Bamberg Job Corps Center. Job Corps is a no-cost education and career technical training program administered by the U.S. Department of Labor that helps young people ages 16 through 24 improve the quality of their lives through career technical and academic training.A typical day at Bamberg Job Corps is full of activities to help our students prepare for the real world. Students get up early and spend the majority of their day receiving academic and hands on career technical training. After class, students study or hang out with friends before dinner in the cafeteria. After dinner, students may do chores in their dorms or spend their downtime studying. Most students are in bed by 10 PM in order to rest for the next day’s tasks. For some cadets Job Corps might be a placement option after graduating from SCYCA. While touring the Job Corps facility, we saw recent graduates from SCYCA who were current students of Job Corps. The graduates of SCYCA encouraged the current cadets to work hard, believe in themselves and the bright future ahead of them. On October 29, 1988, the South Carolina State Museum opened its doors to the citizens of South Carolina. This new facility is one of the finest museums in America. Since the day it opened the museum has awed, delighted and enlightened millions of visitors. The State Museum houses the most artifacts in the State of South Carolina. The building used to be a textile mill. This former textile mill was the first in the world . When it opened in 1894, manufacturing cotton duck cloth (a canvas-like material), it was the first electric textile mill in the world. It was also the first major industrial installation for the General Electric Corporation. It is listed on the National Register of Historic Places. The State Museum has more than 70,000 artifacts in its collection, and it is still a very young institution. The SCYCA cadets toured the State Museum on November 4, 2012. The cadets were able to learn a lot about South Carolina’s history. The Lower Richland Veterans Formation Chapter 2 had their Ceremony on November 03, 2012 . The Ceremony was a great way to show the men and women who served our country how appreciative we are. The guest speaker was Minister Ervin Barnes, and he stated “Freedom isn’t free, There are heroes in the thousands who have been held as prisoners of war or whose fate has never been resolved. Many have been lost in the chaos of battle and the grief of their loss has been more acute for their families. Fellow Americans have been captured, cruelly stripped of their freedom, treated with contempt and brutality, used as pawns by their captors in a larger political struggle. They have fought long, lonely battles against disparity. The citizens of the United states owe a great debt of gratitude to these heroes. It is with great pride and the utmost dignity that we say thank you, because freedom isn’t free, somebody had to pay. Many soldiers have fought so that we as Americans could be home and safe. Fifty Cadets from SCYCA posted the 50 flags of the states to say thank you to the men and women for their services. The state house tour was pretty cool. I was able to learn a lot about South Carolina history. I learned that the palmetto tree is the state tree, because of its history in South Carolina. When the British shot a cannon ball at the confederate barricade the cannon ball bounced off and flew back and hit them. The confederate barricade was made out of palm trees which is soft and spongy. The South Carolina seal has two murals shown on it. The first picture depicts the state tree standing representing the victorious defenders, and the fallen tree is the British Fleet. The second mural depicts a woman standing over swords looking towards the sun. The woman looking towards the sun is supposed to symbolized South Carolina looking forward to a new day. There are also bronze stars on parts of the state house exterior that represent were the state house got hit by cannon balls during the war. There is a lot of history in the state house that you can learn. On Saturday, October 6, 2012 SC YCA cadets volunteered at the 2012 USMC Ultimate Challenge Mud Run. Its “Often Imitated… but Never Duplicated” or at least that is what the United States Marine Core says. Since 1993, the Greater Columbia Marine Foundation has hosted the USMC Ultimate Challenge Mud Run which has grown to attract enlistee’s from all across the United States and Canada. This biannual event was created to raise money, awareness and support for Marines, veterans, and their families in the Columbia area, the state of South Carolina, and across the nation who have been wounded or killed while serving on active duty. Our cadets enjoyed a Field Day on Friday, October 5, 2012 at Camp Long in Aiken, South Carolina. The cadets participated in fishing, canoeing, zip line, rock climbing and other various activities at Camp Long. For many cadets this was their first time fishing. Even though no fish were caught it was a great experience. The cadets were able to relax and enjoy a day in the country. The 2012 Empowering Girls Symposium was held on October 5, 2012. The theme of the symposium was Own It: Be what you want to see in the world. This symposium was full of workshops and keynote female speakers to inspire the future female leaders of tomorrow. Dr. Gilda Cobb-Hunter was a keynote speaker that educated and inspired females in attendance as she shared her life story. Dr. Cobb-Hunter was the first African American women in Orangeburg County elected to a statewide office. She was elected to the South Carolina State House of Representatives in 1992, where she currently serves. The Dr. Cobb-Hunter message to all females were, if you believe in yourself and in your dream, no one can stop you from achieving it. One of the SCYCA Cadets had the pleasure of meeting and talking with Dr. Cobb-Hunter. The Symposium held workshops for adult and young adult females. From SCYCA, Cadet Sabb served on a board of young adult females that talked about their lives. The board gave their audience a small glimpse of what it is like to be a young female in society today . The name of the workshop was “Girls in Juvenile Justice System: Voice for change.” It was empowering to hear how these young females decided that they were not going to allow what anyone said or did to them influence them. These young adults were going to do better and achieve their dreams. APPLICATIONS ARE BEING ACCEPTED FOR THE January 2013 CLASS. South Carolina Youth ChalleNGe is in the process of taking applications and interviewing for the next class. IF YOU KNOW ANYONE THAT COULD BENEFIT FROM THE PROGRAM PLEASE CONTACT US!!!! Our Mission – To intervene in the lives of at-risk youth and produce program graduates with the values, skills, education and self-discipline necessary to succeed as adults. The South Carolina National Guard wants to challenge you with a second opportunity for success. ARE YOU READY TO TAKE THE YOUTH CHALLENGE????????? The Cadets received their test results back from the Official GED Practice Test (OPT) last week. The OPT tells the cadets what areas they need to focus on before they take the official GED. Cadets take general studies, GED classes, which address the content and skill areas needed to pass the GED exam. These classes are general science, general math, general social studies, language arts, reading and writing. The cadets will get a chance to take the GED during their stay at SCYCA. For the cadets that do not receive their GED during the residential phase, SCYCA will cover one GED test fee, up to 12 months after the cadet graduates from the program. The cadets will be taking the first part of the GED on Nov 7 and the second part on Nov 14!! Good luck to the cadets and keep up the good work!! Check out the new commercial!!!!! Cadet Goss View on the ASVAB!!!!!!!!!!!! My experience with the ASVAB test was ok. The asvab test wasn’t so hard. There were things on their that I did not understand, but I focused on the question an picked the best answer. Some people don’t want to take the test. I didn’t want to take it either, but if you stop and think about it and take the ASVAB seriously it will benefit you in the future. You might change your mind and decide to go into the military. Always put your best effort into what you are doing. Stay strong, think twice before you give up. Two Mentors doing a rope Activity!!! Can you think back through your life to someone who you looked up too? Perhaps this was someone that was nice to you or someone who was successful in their career. In our lives there might have been many people who have influenced us. These individuals were a wealth of information. That is why it’s very important to find someone that you can learn from – a mentor. One of the most important parts of the SCYCA program is pairing a cadet with a mentor. Someone from their home town that can give them wisdom. A mentor is someone who sees more talent and ability within you, than you see in yourself. Thank you to all the individuals that decided to become a MENTOR FOR SCYCA!!!!!! Art is defined by many different forms of expression and symbolizes different things for different cultures and groups of people. By definition the word art is an expression of human creative skill and imagination. 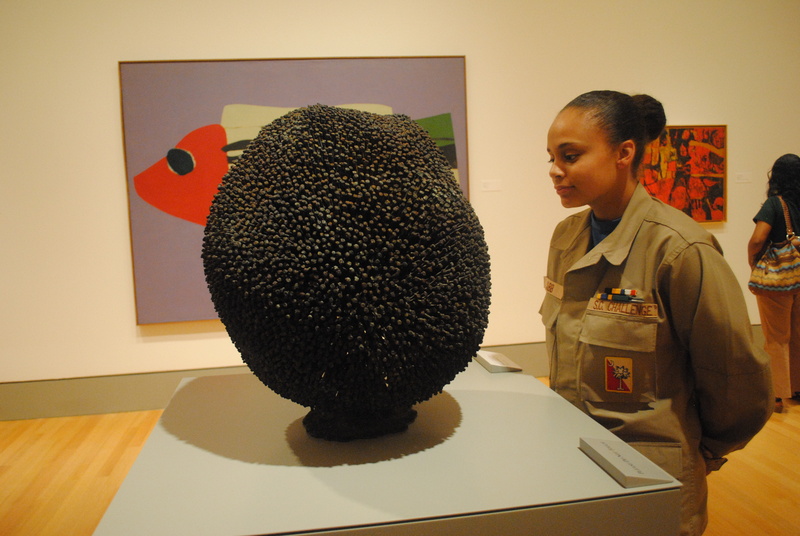 The cadets recently got a chance to explore the Columbia Museum of Art on Friday, September 21,2012. The Columbia Museum of Art has been exhibiting art from around the world since 1950 and has a wide range of works from varying eras. Some of the eras of art displayed at the museum are contemporary, modern art forms, and Asian art forms. Thomas Berger, a famous writer wrote ” What is art but a way of seeing?”, and the cadets got to view an assortment of art works and learned how they could positively express themselves through art. Many of the cadets were fascinated with the stories of the different artist on display at the museum and they learned that even though the artist endured hardships they did not let those hardships define them. The cadets were interested in the ways the artist used their hardships to positively express themselves through their artwork. South Carolina Youth Challenge Academy wants to challenge you with a second opportunity for success. ARE YOU READY TO TAKE THE YOUTH CHALLENGE?????????????????????????????? Yesterday the cadets had their second Physical Training Test (PT). The Cadets had their first PT test during the first phase of SCYCA, to find out where they were when it comes to physical fitness and health. The program encourages lifelong commitment to physical, mental and emotional well-being. Cadets must show improvement during the 22-week residential program. Activities include, but are not limited to: military style PT, running and organized sports. The cadets have worked hard over the last 11 weeks physically. During the PT test yesterday they saw the benefits their of hard work. Many cadets did better on the second PT test!!! Congrats to the Cadets Good Job!!!!! Want to find out more about what the current cadets are doing or do you know a youth that would benefit from becoming apart of South Carolina Youth Challenge Academy. This Blog is a great source to find out about SCYCA!!! Find more information at http://www.ngycp.org/site/state/scco/ or on facebook at http://www.facebook.com/SCYCA or on Twitter @SCYCA!!!!! Welcome to the SCYCA BLOG! !